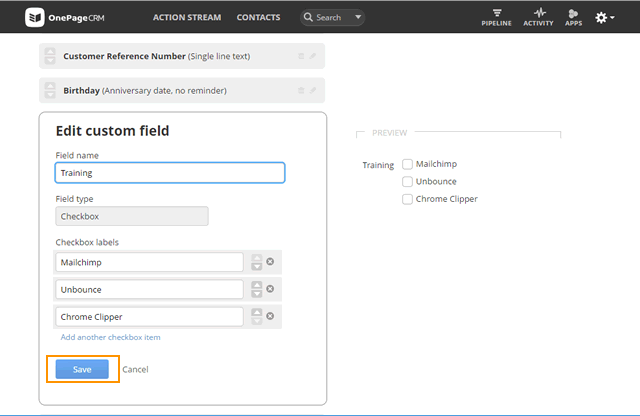 Customize your contact's data with Custom Fields. You can create additional fields to store information about your contacts. 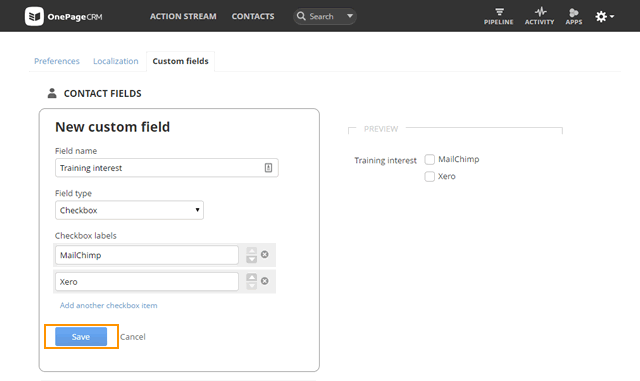 There are 3 types of custom fields: Contact, Organization and Deal custom fields. These Custom Fields can be added, edited or removed only by an Account Owner or Administrator user. Go to the gear icon → Click on Settings → Custom Fields tab → click on the + Add icon. In the New Custom field box → add your custom field details. Single line text - alphanumeric text field that accommodates a few words on a single line. Multi line text - alphanumeric text field that accommodates longer text on multiple lines. Number - numeric field that only holds numbers. Dropdown - drop-down list with options. Date - calendar date field used for date joined etc. Checkbox - allows multiple selections from a list of values. Anniversary date - calendar date field with the option to be reminded of an anniversary by email. This can be used for birthday, expiry date etc. Note: This is not available for Organization or Deal Fields. Click Save to create a new custom field. To re-order the list of custom fields → use the up and down arrows. Click on pencil icon to the right of the custom field you wish to edit. In the Edit Custom field box → update the details of your choice or Add another checkbox item. Click on the bin icon to the right of the custom field you wish to delete. In the warning message, click OK to confirm deletion of the custom field. To enable the Title custom field, check out How to add Title to a contact? You can re-order checkbox and dropdown field labels by opening the custom field you wish to edit and clicking on the arrows. You can also follow these steps to add/edit/delete Custom Fields for organizations using Organization Fields and deals using Deal Fields. There is no Anniversary date field type for Deal Fields.